I’m praying Sweat falls to us. I’ve always thought (hoped) Luck would get 7 ( ). A couple back to backs and a 3peat (). But I’ll take a couple 1 offs, a back to back, and a 3peat to make up Luck’s Lucky 7(). 7 and Luck can still be the . I’m with Irsay. Go COLTS!!! I mentioned Funchess a lot as a potential target for us this offseason. I'm shocked at how much negativity bringing him in on a 1 year deal has created. I actually think a 1 year deal is perfect. It gives Cain a year to develop without the pressure of being the WR2 behind TY but it also gives Cain a target (in Funchess) of a guy that he can surpass and supplant maybe even next year. It was surprising to hear about Devin's drops last year but wasn't Ebron known for the same thing until we brought him in??? And looking at some of the game tape of Funchess that guys have posted on this thread it's quite apparent to me how Luck and Frank will use him. He will see a lot of back shoulder throws, deep ins, and post corner routes. Also he will get a lot of red zone work. I expect to see him get a lot of work on double moves in the red zone like Inman ate up the Texans with in the playoff game. That seems to be his specialty. 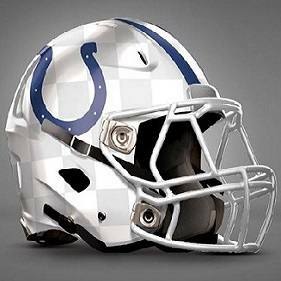 Luck will get the most out of him and I wouldn't at all be surprised if that resulted in double digit touchdowns. If everything falls just right, Luck will throw for 40 more TD's and could flirt with 50 next season. Not a bad signing at all. And if AJ Brown is still there when the pick we got from the Jets comes up, I expect us to draft him with it. I see us using our first rounder on defense. CB or DL. Inman is a very mature guy. Hearing this interview and the one with JMV, football isn’t everything for him. He was already planning his post football career and will continue to do so in the offseason. It’s clear he’s looking for the “right fit” and he believes the Colts is that fit. He’s coming back and I’m sure Frank and CB want him back. Be it as #2, 3, or 4. You can’t beat solid depth like Inman. Guys get hurt all the time and he’s the consummate pro who can step right in and contribute without missing a beat. Every team needs pros like Inman. Glad we brought him into the fold. Colts have 4 first rounders in CBS Sports re-draft. I see what you’re saying but I stand by my assessment. Sure, Collie maybe could have tried to immediately go down “while” making the catch but the fact that he was still contacted by 2 defenders in a bang-bang fashion “immediately” after making the catch tells me that he didn’t have a lot of time to do much of anything and it was a dangerous throw by Peyton. Regardless, that play changed the course of Collie’s career. He was easily concussed thereafter and it was a shame because he was a heckuva receiver. And those uniforms with the blue helmets were SICK. Shame that hit will always be a memory of them. Well on the play that changed everything, Collie never had a chance to get down. The following concussions (where he maybe didn't get down quick enough) all stemmed from that play against the Eagles where Peyton got him nearly decapitated. He really was headed to being an all time solid receiver for us. Since he never got to put in the time to reach that level, I'd have to list Brooks as the next best on that list. What an amazing video... My Goodness. Young Edge (pre knee injury) looked like the 2nd coming of Jim Brown. His vision & balance were second to none. Wow. He would have flirted with 2000 yards behind our current offensive line. With the maulers we currently have & Edge getting better with every carry... I have no doubt about that. And people say Peyton made him... Check the stats. Peyton was 3-13 his rookie year and a turnover machine. Bring in Edge the next year and we go 13-3. Peyton nearly cuts his interceptions in half & Edge leads the league in rushing. Truth is Edge helped Peyton settle in & grow because he had an immediate Hall of Fame type back that he could give it to 20-30 times a game to take the pressure off. He was that special. Belichick broke out his old gameplan he used to shutdown Manning and our high powered offenses back in the day... Tell his DB’s to hold the receivers past 5 yards and get Peyton (Mahomes this past Sunday) to hold the ball until the pressure could get home. Not surprisingly, the refs didn’t ever call it. Imagine that. Mix that with a focus on ball control & clock management to limit the possessions the opposing high powered offense can get all while tiring out their relentless pass rush and you get the results you got last Sunday & against our Colts back in the day... Unfortunately, Andy Reid took forever to adjust and call more stacks, picks, & rub routes. Allowed the Pats to get the lead & exhaust Chiefs pass rush. It showed later in the game when they couldn’t get any pressure to throw off Brady’s timing. Romo calling it and Chiefs can’t see it. Sickening. Where’s Ford, Jones, & Houston? Worn out from the first half time of possession ? Burkhead gonna fumble it away. Nope. TD ends the game. Now KC needs to win the toss and go kill em. Don’t pull a Saints & give it away. Let’s have both championship games go to OT. Kelce on the deep corner route. I wonder what the Patriots record is with Clete Blakeman as the referee?